Why is Valve getting into virtual reality? Why is Valve making Steam Machines and the Steam Controller? 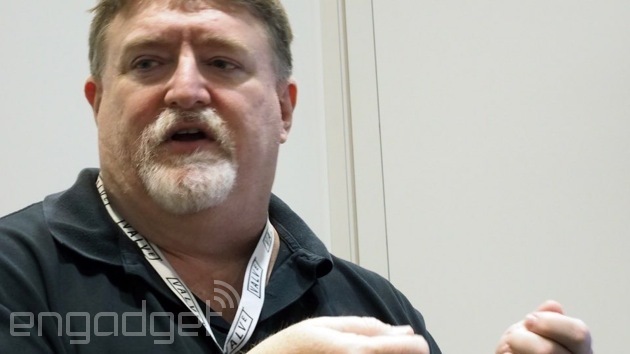 Why did Valve make its own Linux-based operating system? Why did Valve make the Steam Controller? Why is Valve releasing its game engine, Source, for free? It's the Steam economy, stupid! "We're trying to build standard interfaces and standard implementations that other people can use. Because, to be honest, we're going to make our money on the back end, when people buy games from Steam. Right? So we're trying to be forward-thinking and make those longer-term investments for PC gaming that are going to come back a couple years down the road." The most current numbers on Steam usage are from last week, with 125 million "active accounts" -- that's not total accounts, but accounts being used with some regularity. The Steam library is around 4,500 games, depending on what you count (that number excludes game add-ons and non-game software -- thanks to Ars Technica's Kyle Orland and his Steam Gauge database for this number). Valve gets approximately 30 percent of each sale made on Steam. Thirty percent! That's not for every single game, and there are plenty of free-to-play games, so that's not a direct "30 percent take from all games sold on Steam," but it's not far off. For a taste of what that number can mean, we turn to Sega's lawsuit with THQ over the pre-order profits from Company of Heroes 2 on Steam. As Eurogamer reported in 2013, "There were 20,755 pre-orders for CoH2 registered through Steam from September 2012 to 24th January 2013. That generated revenue of $1,345,301.29, but, as is standard, Valve takes a 30 percent cut of Steam sales, leaving publishers and developers with 70 percent -- in this case $941k." Approximately four months of pre-orders, totaling approximately 21K copies, brought Valve over $350K in revenue at the cost of running servers and consuming bandwidth. That's not even sales of the game, but pre-orders. And that's a single game among thousands. Without giving direct numbers, Newell told us, "The PC has been going gangbusters lately. Steam revenue's up 50 percent year-over-year, which tracks closely to overall what's happening in PC." Operating Steam is a very lucrative business. So much so, in fact, that Valve's entire business is built around Steam. "But Valve's a game developer! Why isn't Valve making games?!" you ask with a crowbar in one hand, a headcrab hat sitting atop your dome. The short answer is, well, Valve is making games. Counter-Strike: Global Offensive and DOTA 2 are primary examples: Valve is still making games, but only insofar as they're experiments in new models for Steam. Counter-Strike: Global Offensive is, "Here's how to make a successful eSports shooter on Steam!" DOTA 2 is, "Here's how to make a successful eSports MOBA game on Steam!" With Steam Machines/Controller, Steam VR/Lighthouse and Steam Link, Valve is making a big push into physical hardware. Why? Because it all rolls up into Steam. You may have noticed Steam's search functionality adding support for VR games back in December 2013. Or maybe you used Steam's in-home streaming functionality, which started beta testing one month earlier in November 2013? Or maybe you've got your own gaming PC in the living room, running Steam's living room-friendly Big Picture Mode, first introduced back in 2011? All of these initiatives serve one purpose: Extend the reach of Steam. The hardware Valve just announced, from its $50 game-streaming box (Steam Link) to its VR headset collaboration with HTC (the Vive), all directly rolls up into Steam. It's the one common denominator among all these variables, and Valve's been setting up foundations for this push across the past several years. Steam Machines and the Controller couldn't exist without Big Picture Mode (and now, SteamOS), just as Steam VR doesn't make much sense without a store already populated with VR games. Steam Link is a physical extension of in-home streaming tech you could already be using. The good news is that, while this all serves to make Valve richer, all these moves achieve the parallel goal of serving the PC gaming community at large. As Newell puts it: "[There's] lots of hardware innovation: 4K and 5K monitors, G-Sync, 140Hz monitors. And all that's driving what's going on. So from our point of view, we sit back and say, 'What's going to be helpful? How can we keep PC gaming moving forward?'" "Hardware and software pushes into streaming, VR and living room PC gaming from the company that owns the largest digital game service in the world" is apparently Valve's answer. Don't miss the rest of our coverage from GDC 2015! Check out our events page right here.